Grinding, pumping, dosing, mixing – there are a multitude of tasks associated with conveying liquid media, especially in the wastewater and environmental sector. Smooth processes are essential here, just as they are in biogas production. System malfunctions cause significant problems. NETZSCH Pumpen & Systeme GmbH therefore offers a great variety of perfectly coordinated pump solutions, accessories and services for these sectors from a single source. These range from various types of pump, such as those with flange mountings, a wide variety of designs of the hopper pump, mixing pumps, immersion pumps and TORNADO rotary lobe pumps, through to the overhaul of ageing pumps, and also include NETZSCH macerators and accessories, such as the aBP module for preventing bridging and the dry running protector. The whole product range with its flexible configurations and application options will be presented at this year’s IFAT. NETZSCH has been designing and manufacturing pumps and macerators in Waldkraiburg, Bavaria for more than 60 years. At first the company specialised in progressing cavity pumps, but over time it has also developed into an expert in rotary lobe pumps. Customers are provided with comprehensive advice that is tailored to their requirements in terms of choosing the appropriate pump for a specific application. NEMO® progressing cavity pumps are particularly suitable for pressures up to 48 bar (higher pressures on request) and for media with a high dry matter content, such as dewatered sludges or liquid manure, silage and biowaste for biogas fermentation. Their conveyance principle is based on a rotor which turns in an oscillating motion within a fixed stator. The geometrical mating means conveying chambers are formed between the rotor and the stator. As the rotor turns in the stator, the medium is transported from the inlet to the discharge side in these chambers. This is achieved with stable volumes and pressure, irrespective of the consistency or viscosity of the medium. The addition of a screw conveyor is possible for particularly viscous media. One of the pumps used for biogas production is the NEMO® B.Max® mixing pump. It has specially positioned feed tubes for liquid manure and so optimises the pre-mixing of different substrates within the pump. The homogenised substrate then goes into the fermenter where it can immediately be processed by the bacteria. Formation of scum is prevented. This reduces the effort involved in mixing in the fermenter. The innovative iFD stator 2.0 for NEMO® progressing cavity pumps makes maintenance particularly easy: the fact that the elastomer is not vulcanised into the stator, but just positively clamped, means it can easily be taken out when worn and disposed of as sorted waste. It is just as quick to install and fix a new stator, as it can easily be pushed onto the rotor while not tensioned. Its development was promoted by the “Environment” Trust. In addition, the design means lower start-up and operating torques are needed and energy costs are therefore reduced. The compact, robust TORNADO® rotary lobe pump is available for areas with confined spaces or for mobile applications. Its large free ball passage means it can also handle lumpy media without any risk of clogging. With a pumping capacity of up to 1,000 m³/h, the TORNADO® even deals with large quantities of wastewater. With the T2 model there is the possibility of flange mounting the motor above the conveying chamber as well, which then gives you one of the shortest pumps on the market. This design is also particularly well suited to being mounted onto a trailer (TORNADO® Mobile) or onto a moving device and to being moved from one operating location to another as a mobile unit. The T2’s belt drive ensures that it runs very quietly and operates without oil, as well as making sure that you avoid a complete write-off of the kind that can occur with conventional synchronised gear boxes. The special feature of the belt drive is its double toothed belt which enables both power transmission and synchronisation of the rotary lobes. Both types of pump have in common that they are in each case tailored to the characteristics of the media and the conveying tasks in terms of the design and selection of materials. This means long, low-wear operation is ensured. In addition, the direction of rotation can be reversed on NEMO®and TORNADO® pumps and their conveyance volumes are proportional to the speed. The latter feature gives high dosing accuracy. 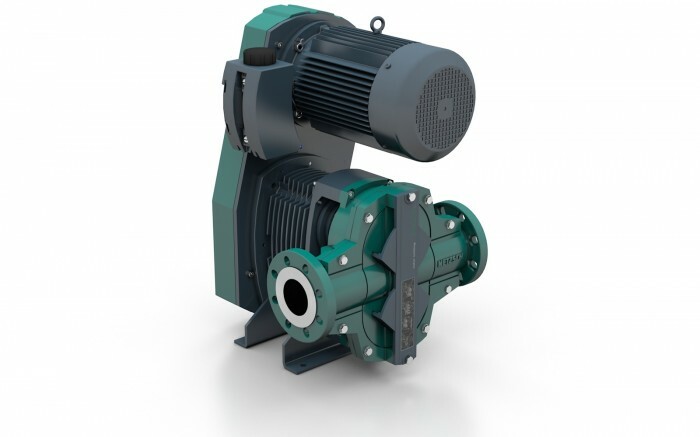 The design of both types of pump focuses on simple maintenance and cleaning. For example, after the pump cover has been removed, the T2’s rotary lobes and housing insert can easily be disassembled, as free access to the pump chamber is ensured from flange to flange. The pipe flange do not have to be removed either. The rotary lobes are attached outside the pump chamber. Pumps can be complemented by various accessories, depending on the requirements of the application. This includes amongst others the aBP module®, which prevents bridging when filling with compacted or crumbly media. To achieve this, a support is placed onto the pump hopper which carries a stainless steel spoked wheel on the inside of each of the side walls. These are independently rotated counter to one other using two screw gears. The shear forces which are created by this process tear material bridges apart as soon as they start to form and before any blockages can occur. NEMO® pumps can be fitted with a stator protector to protect the stator from damage due to dry running. There are also contact manometers for measuring overpressure or vacuums, pressure transducers, frequency inverters, moving devices and control systems. NETZSCH offers various macerators for the reliable conveyance of media with coarse impurities, like the ones that are frequently found in wastewater, but also for macerating substrate in biogas production. The compact M-Ovas® macerator for coarse materials works with a cutting plate made of hardened steel that can be used on both sides and a knife head with hard metal blades which is supported by a flywheel. Dense materials, for instance stones, are caught in an integrated collector-separator as they pass through the system and can be removed via its separate cleaning and drainage aperture. If the solids are particularly large or robust, then the NETZSCH twin shaft macerator is used instead. With this, the cutting units are designed as single-part cartridge elements, each with six knives made of special steel along with six spacing rings, which can easily be replaced as a unit for maintenance. In addition the system can be self-cleaning, using the very slow, variable speed. Its flow rate is up to 300 m³/h with a dry residue content of up to 10 percent. The NETZSCH service team is there to support customers with all their concerns, both before and after buying a pump. The company therefore offers on-site training sessions for new equipment and also provides support with commissioning. In the event of damage, specialists help with troubleshooting or make sure that original spare parts can be delivered all over the world in the shortest possible time via their international branches. The appropriate components are supplied even for older systems, or these can be upgraded with new technology if requested. This service, in combination with the broad product portfolio and its application options, helps in increasing service lives, reducing operating costs and finding the appropriate pump for every medium. NETZSCH Pumpen & Systeme GmbH will be exhibiting its products in May at IFAT 2014. The “Environment & Energy” team is looking forward to using exhibits to show and explain innovations and special technical features of their products to customers and potential customers in the field of pumping technology.